Staging Fashion, 1880-1920: Jane Hading, Lily Elsie, Billie Burke (Bard Graduate Center for Studies in the Decorative Arts, Design & Culture) Link Edited by Michele Majer. What a pleasure to read this book! 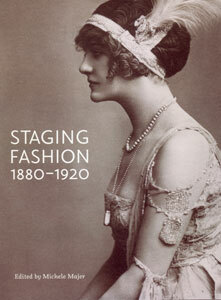 Staging Fashion 1880 – 1920 is lavishly illustrated but is no mere coffee-table book. The thoroughly-researched and well-written essays tell us so much about the lives of the three featured actresses Jane Hading, Lily Elsie and Billie Burke, but also offer the reader much fascinating information on women’s history, celebrity culture, and even the era’s collection mania for postcards! Although my particular interest is with Lily Elsie, the biography of Jane Hading was a marvellous revelation as I had never heard of her before. What an astounding fact when, in her day, she enjoyed the same celebrity status as “the divine” Sarah Bernhardt! I found myself reading even the endnotes with great pleasure for the nuggets of information they contained. All those involved in this publication can be proud of what they have achieved.